Scott McDougall is a self-taught artist who has been working professionally since 1972. While growing up in Humboldt county in northern California, Scott started surfing in 1965 and has had a fascination with waves ever since. His first commissions were in 1970 doing hand lettered and illustrated concert posters, which he still produces to this day, using many of the same techniques. 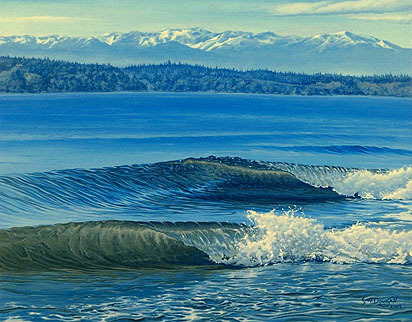 In 2005, Scott had his first one-man show of wavescape paintings in Seattle, Washington. His focus was on the small point break waves that are created by barge traffic in the Puget Sound in Washington State. He found the scale of very small waves interesting in the way light played in water usually less than a foot deep. 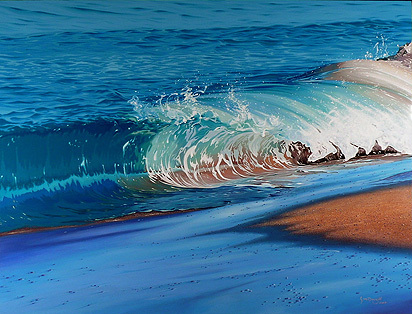 Although many of the waves he paints are not rideable, the shape and water conditions are surely recognizable to surfers. 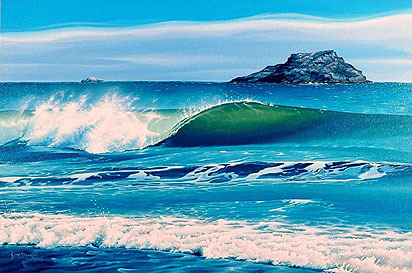 Scott had another one-man show in 2007 of his wave paintings along with his poster art. Currently, he is working on a series of paintings from a recent trip to Mexico along with continuing commissions from the Grateful Dead.